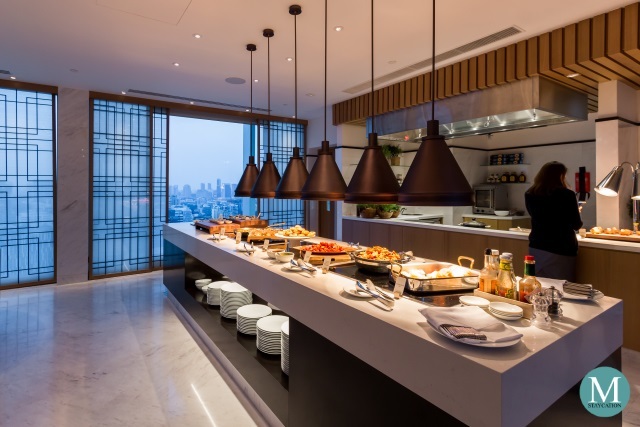 The Horizon Club Lounge of Shangri-La Hotel Singapore is located on the 24th floor, the topmost floor of the hotel's Tower Wing which offers guests a panoramic view Singapore's verdant urbanscape. 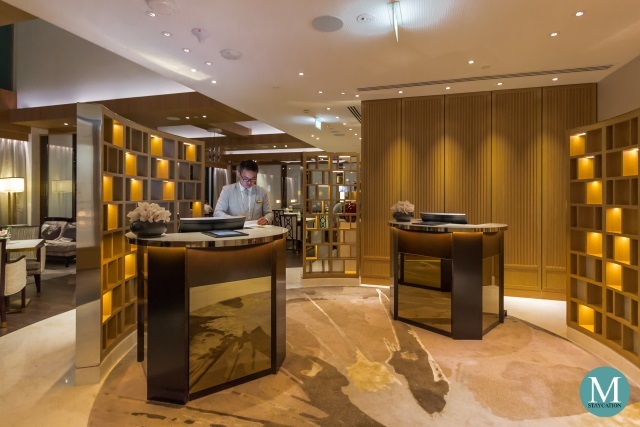 Following an eight-month renovation program, Shangri-La Hotel Singapore reopened the Tower Wing last May 2017 and unveiled the new Horizon Club Lounge with a more modern design. 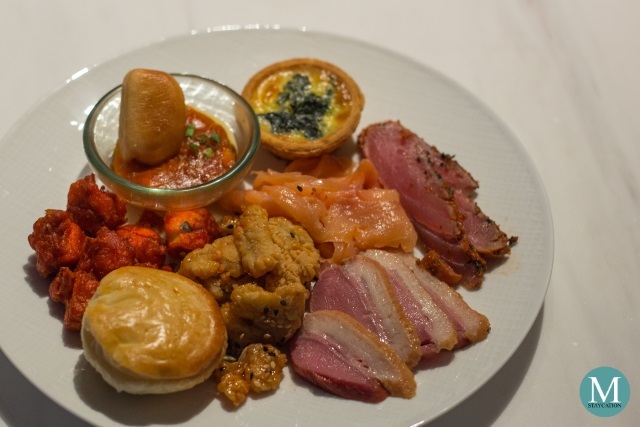 The complimentary afternoon tea at Horizon Club Lounge of Shangri-La Hotel Singapore is served buffet style with a wide selection of savory and dessert items. There are at least four tea sandwiches choices, plus a variety of savory pies. There's also freshly baked scones and jams. 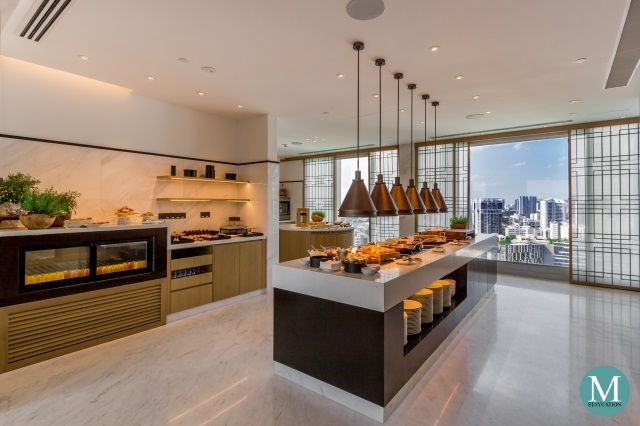 For dessert, Horizon Club Lounge guests can choose among cakes, eclairs, macarons and kuih lapis. For drinks, guests can opt for brewed coffee, espresso based crafted drinks, premium teas, and bottled fruit juices and canned soda. 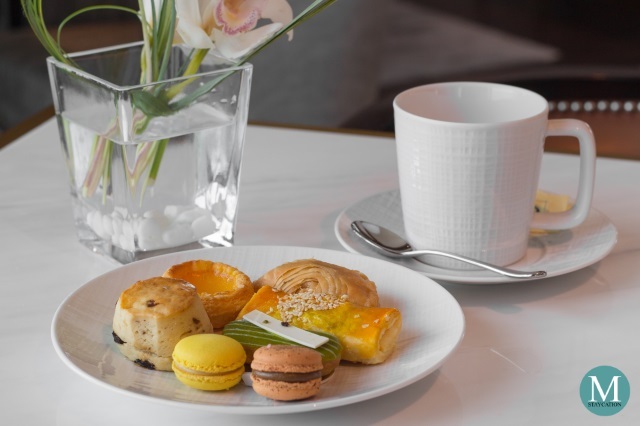 The complimentary afternoon tea is served daily from 2:00pm to 4:00pm. Equally generous is the buffet spread of canapes during the pre-dinner cocktails. There are premium cheeses and charcuteries as well as a couple of hot dishes and savory pies. My most favorite was the mantao served with chili crabs sauce. For dessert, guests can choose from selected cakes and pastries. For drinks, guests can choose from the extensive selection of wines, beers and spirits. You can also order cocktails or mix your own drinks. Non-alcoholic beverages include chilled juices and canned soda. Available daily from 5:00pm 8:00pm, the pre-dinner cocktails and canapes can easily be filling and can pretty much pass as a light dinner. 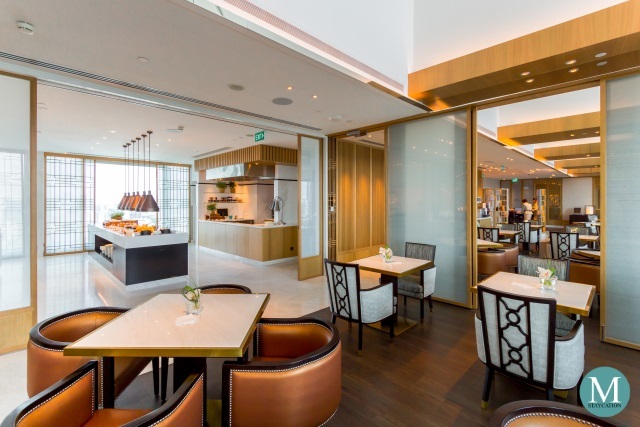 The Horizon Club Lounge is open 24 hours so guests can still enjoy the complimentary non-alcoholic beverages even after the pre-dinner cocktails. 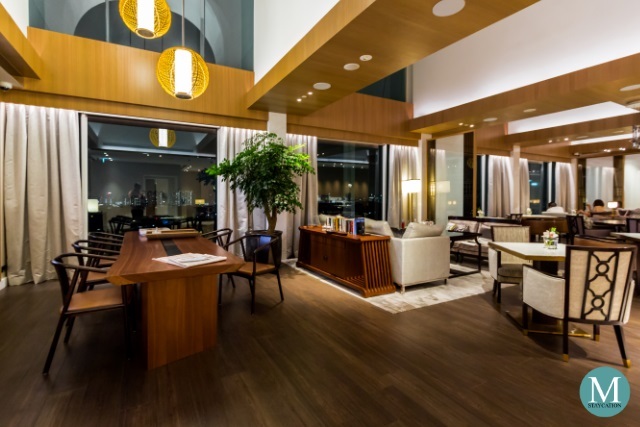 Night owls can also work with their laptops at the Horizon Club Lounge while sipping on their favorite espresso-based beverage. I particularly love the long wooden table near the entrance to the lounge. This is where I spent a couple of hours in the evening replying to emails and drafting some blog articles. It is also conveniently located near the coffee station. 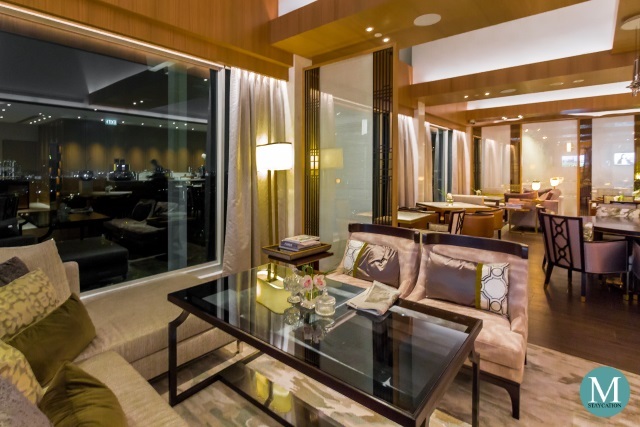 The Horizon Club Lounge is perfect for business travelers who wish meet with their business partners or clients in a casual setting. 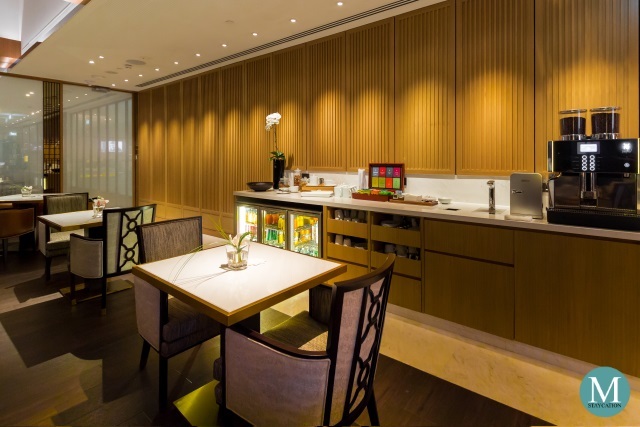 Staycationers will also love the convenience of having an access to the lounge, especially in the middle of the night when you feel like having tea or fresh orange juice. 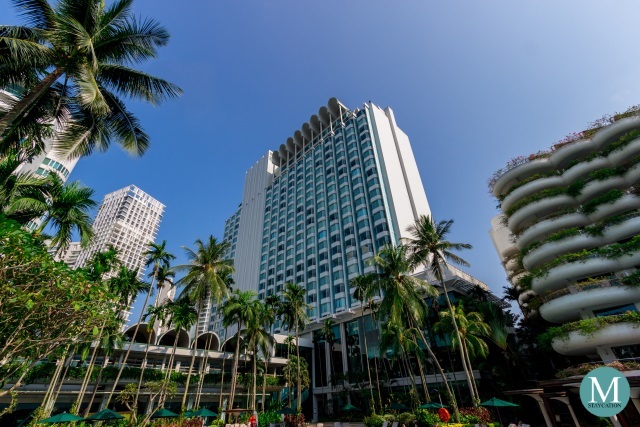 IMPORTANT: Please note that a keycard is required to access the Horizon Club Lounge from 12:00mn to 6:00am.